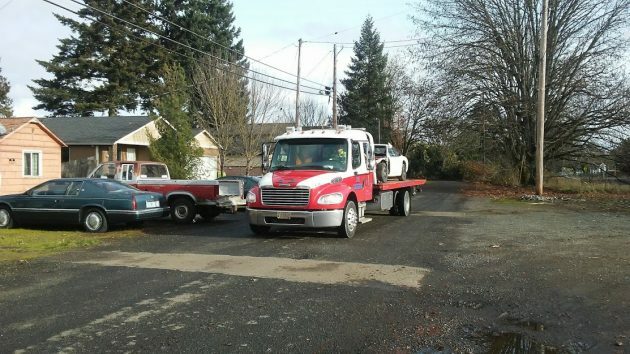 AA Towing’s rig takes off with the derelict Nissan that had been abandoned on railroad property, right, at Second Avenue and Chicago Street. AA Towing had been engaged to get rid of this former automobile, a pile of junk that was a blot on the neighborhood for months. I had written about this example of urban blight in October after calling it to the attention of Albany code enforcement. Then last week I learned that a community service officer with the Albany police had talked with the Portland & Western Railroad, on whose property the thing had been dumped. The railroad posted a notice that it would have the car towed. What I saw Wednesday — AA Towing hauling the thing off — evidently was the result. I assume the railroad is stuck with the expense of this cleanup operation. 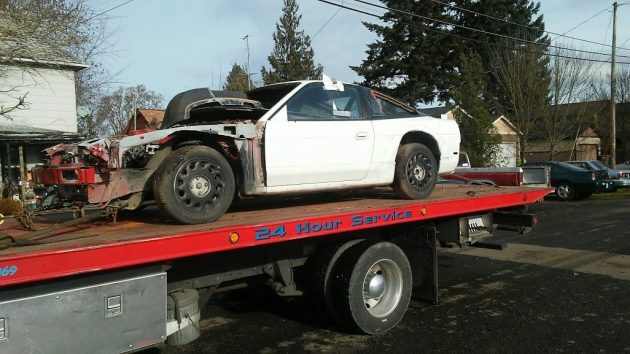 But as I understand it, when junk cars are dumped and eventually have to be towed to a police impound yard, what usually happens is that the tow company will go through the DMV to obtain the name of the vehicle’s last registered owner. Then that person gets the bill even if he hasn’t owned the vehicle for years. That’s why its useful, when you sell a used vehicle to a private party, to notify the DMV that you are no longer the owner so that your name gets taken off the registration. On its way to an impound yard, a scrap of the tow notice still attached to the window. So “shaming” on H. H. blog evidently works! His blog is a great tool. This format is kind of like the old Jack Benny radio episodes where you would only have one sponsor like Jello (only with a 21st century twist). Replace the “Hasso Hering” on top and change it to “Hasso Herring presented by…”. Did you click on his “Advertise on HH-Today” link above? His Google traffic is showing pretty good, surprised someone hasn’t picked up that deal yet. I bet if Hasso looked at his analytics a bit deeper, he would find out most of his audience is in an income bracket much higher than the median income for the valley, if you’re selling, those are the eyeballs you want. His only downside is he doesn’t have specificity, you don’t have someone coming to the blog for a specific purpose that translates to a good or service that you want to purchase, he would have to discount his clicks for that. His major upside for an Albany sponsor, is he’s local, and based on his analytics, he probably has more traffic than almost anyone else in the Albany market. Just signing the back of your registration and noting the name of the new owner doesn’t ensure that your name is taken off the DMV records. The best thing to do is remove the license, take them, the new owner, the registration and title to DMV directly. Or just remove the license and take the registration to DMV. As long as your name is still on the title, according to Oregon Law you are still liable for tickets, accidents, etc. In this case it is SELLER BE AWARE.